1 pair of N5210 (8" Dressmaking Shears): The Kai 5210 8-inch has ergonomically soft handles which allow fatigue-free cutting on all types of fabric. Cuts multiple layers of denim with ease while trimming cottons without any fabric slippage. The Kai 5210 is the standard size handle and blade length. 1 pair of N5135 (5 1/2" Scissors): Quilters love this size for trimming "dog ears" and clipping threads when chain piecing. This smooth, comfortable scissor is perfect in your sewing kit for take along projects and sewing classes. 1pair of N5100 (4" Needle Craft Scissors): Sharp pointed tips allow for detailed cutting and trimming. Very popular for trimming threads, Hardanger embroidery, beadwork, rug hooking, and fly tying for fishermen. 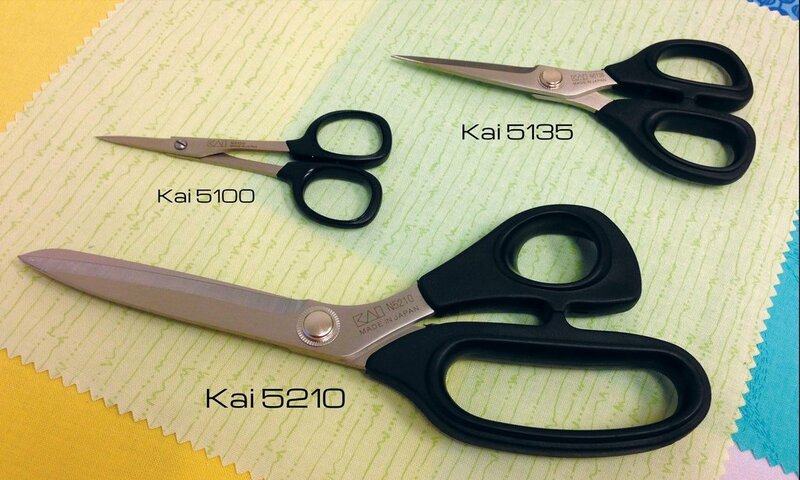 These Kai 5000 Series scissors are made of a hardened stainless steel. The smooth, sharp blades give the Kai scissors an amazing smoothness in cut and feel. Whether it's for a friend, family member, or even yourself, this is the premier gift set for those seeking out performance-level scissors. A blade cover for each scissor is included in every gift set.